Readers are reminded that you can search for a car that has been tested in BTN, and also check out those reviewed in the Motoring Index This weeks ON TOUR might interest you too. Watch Out! A New Kia On The Bloc! Seven is an important number for this recently arrived third generation Kia Sorrento – it comes with Kia’s bench marking seven-year/100,000 miles warranty and seven seats. Two important factors, I suggest, that make this hugely competent 4x4 a strong attraction in an ever booming MPV and 4x4 market sectors. Visually it is a stylish looking large hatch-back that is not dimensionally cumbersome, though it provides impressive interior accommodation, admittedly with all seven seats in use there is not much luggage capacity available – unless one adds on roof rails. Inside it is also a smart act, not luxurious trim wise but confirming its maker’s aim of moving up to premium class build/trim standards. Interior comfort as a five-seater is very commendable and even with the pair of far rear seats in use, no occupant should have cause to complain. It may have its roots in South Korea, though importantly it is clearly European through and through, by that I mean the overall design, fittings and fixtures, high levels of mechanical refinement/efficiency and the excellent driving performance. 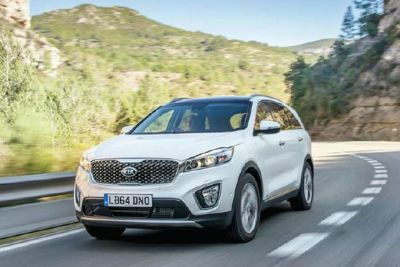 The 2.2-litre turbo diesel power unit is a real gem, being the fourth generation of a Kia design that employs double overhead camshafts, a balancer shaft and sophisticated emission systems. Producing a whacking 197 bhp in an immensely flexible, quiet and refined manner and driving through a slick shifting six-speed manual gearbox (a six-speed automatic is also offered) this is hardly pushed to provide lively yet easy driving performance of a claimed top speed of 124 mph and acceleration from rest to 60 mph in a more than passable nine seconds. Expect to see around the 40 mpg mark under mixed driving that should see a range of around of 360 miles from the 15.6 gallon tank. The Sorrento has always been, in my opinion, a vehicle for so many uses, it is practical with easy access and good oddments stowage, easy to live with for the driver when it comes to ergonomics overall vision (a rear view camera is included) and very well equipped – this includes the emission/fuel saving stop+start system, hill hold, cruise control, auto folding exterior mirrors, satellite navigation and the usual communication/entertainment connectivity. Yes, it is a four-wheel drive machine though one would not know it, as the system normally runs in two-wheel drive with power distributed to all four wheels when it senses a challenging gripping situation. On the road it drives in a compact and responsive manner, light yet well geared power steering, powerful braking with minimal pedal effort, a light clutch action, good stability and obviously stable and sure-footed handling. The Kia story has been one of constant successes for some time now and with an ever increasing vehicle range that embraces a wide market, this latest Sorrento continues the upwards climb of a brand that is very well marketed with some sage sponsorships to project the right image. In an earlier test of the second generation Sorrento I reported that it had the right credentials to be at home as a courtesy vehicle in a VIP resort and this latest example should prove a worthy vehicle for continuing that role, particularly at those venues that are a bit off the beaten track. That said, it is also a strong alternative to a premium class estate and an ever stronger challenger to similar or even larger sized 4x4s, particularly those that can’t take seven!